A lack of clear performance expectations is cited by readers as a key contributing factor to their happiness or unhappiness at work. In a poll about what makes a bad boss bad, the majority of respondents said that their manager did not provide clear direction. This factor affected their sense of participation in a venture larger than themselves and their feelings of engagement, motivation, and teamwork. A company strategic planning process that defines overall direction and objectives. A communication strategy that tells every employee where their job and needed outcomes fit within the bigger company strategy. A process for goal setting, evaluation, feedback, and accountability that lets employees know how they are doing. This process must provide opportunities for continuing employee professional and personal development. Overall organizational support for the importance of clear performance expectations communicated through cultural expectations, executive planning and communication, managerial responsibility and accountability, rewards and recognition, and company stories (folklore) about heroic accomplishments that define the workplace. Communication starts with the strategic planning process of executive leaders. How they communicate these plans and goals to the organization is critical to creating an organization in which all components are connected and pulling in the same direction. Executive leadership must clearly communicate its expectations for the team’s performance and expected outcomes to align each area of the organization with the overall mission and vision. At the same time, leadership needs to define the organizational culture of teamwork desired within the company. Whether a department team or a product, process, or project team, team members have to understand why the team was created and the outcomes the organization expects from the team. The Performance Development Planning (PDP) process translates these higher level goals into the outcomes necessary for each employee’s job within the company. After the quarterly PDP meeting, employees should be clear about their expected contribution. Goal setting at these meetings should include a performance evaluation component, so the employee knows how he or she has been performing. Leading up to the PDP meeting, the employee self-evaluation guides each employee in thinking about their performance. 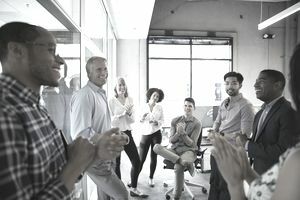 The six-eight goals set at the meeting or continued from the previous PDP, establish performance expectations without micromanaging the employee. Deciding how to accomplish the goals empowers, engages, and motivates the employee. The manager maintains needed contact with the critical steps in the employee’s performance plan through weekly meetings and coaching. This step ensures that employees are accountable for accomplishing their jobs. Consider following this same process with each team you establish for the same sense of interconnectedness and understanding of clear performance expectations. You need to show constancy of purpose in supporting individuals and teams with the resources of people, time and money that will enable them to accomplish their goals. When you provide the resources teams need to succeed, you ensure the development of teamwork and the team's best chance for success. Sometimes, this requires the reshuffling of resources or the renegotiation of goals. But, the visual application of resources sends a powerful message of support. The work of the team needs to receive sufficient emphasis as a priority in terms of the time, discussion, attention, and interest directed its way by executive leaders. Employees are watching and need to know that the organization cares. The critical component in continuing organizational support for the importance of the accomplishment of clear performance expectations is your reward and recognition system. Clear performance expectations accomplished deserve both public recognition and private compensation. Publically cheering and celebrating team accomplishments enhances the team's feeling of success. The recognition communicates the behaviors and actions the company expects from its employees. How to Manage an Employee Whose Performance Is a Challenge? Are Annual Performance Reviews Enough to Ensure Employee Success? Want to Know the 8 Best Practices in a 360 Performance Review?